Professional event planners wear many hats and take on a variety of responsibilities, depending upon the individual circumstances of an event. This profession requires a unique skill set — you may need to be a multitasking wizard one minute and the next to be an expert problem solver who can resolve a situation with ease and efficiency. An event planning business proposal is a comprehensive document that outlines the services you will provide for an event. It is your company brochure, your marketing campaign, and your sales pitch all wrapped up into one. This event business proposal should present you as an experienced, skilled professional that is uniquely qualified to execute this event. It should distinguish you from other event planners and establish you as someone the client can trust. An event planning business proposal should be well written, contain specifics regarding what services are included in the proposal (and which ones are not), and illustrate how you will carry out the event, providing the necessary details so the client can easily envision what you are proposing. An integral step in event planning is drawing up a rock-solid event planning business proposal, knowing what to include in order to market your services and secure a client’s business. Business Introduction: Briefly introduce your event planning business. Discuss your background, any professional certifications, and length of time in business, relevant experience, and your particular niche if you have one. Description of the Event: Provide an overall scope of the event, including details that were discussed during your initial client meeting, such as the goal of the event, possible dates, venues to consider, number of guests, etc. Event Planning Services to Be Provided: Be very specific in this section, listing all the services that you will provide for this event. Listing items with bullet points or subheadings are very effective as it is an easy way for the client to see the range of services included. List any vendors that you will use and any services that are optional for an added fee. It is important to be very detailed in this section so the client has a clear understanding of what is included and what is additional. Examples of Your Work: If you have planned an event similar to the one you are proposing to this client, then this is your chance to show off those skills. Include photos, sketches, news clippings, or any other visuals that will help paint a picture in the client’s mind of what you can do. This is a great way to market your event planning business. Proposed Costs: Carefully articulate all the costs associated with the planning and execution of this event. Formatting this section as a series of steps will guide your client through all phases of the event, helping them to visualize each aspect as it unfolds. Be specific within a general category of costs. 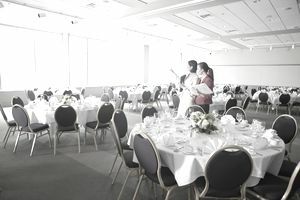 For example, if you have a line item for catering, break out the individual costs for food indicating the amount per person, the number of servers required and the hourly rate, expenses for table rentals, linens and so on. Instead of preparing a proposal with one big price tag at the bottom, write an itemized proposal so your client can understand individual costs. This is helpful for two reasons: it thwarts the inevitable “sticker shock” when all items are tallied and there is a big price tag at the bottom, and it gives your client the opportunity to decide whether the cost for the extra cocktail hour is worth the expense. Next Steps: At the bottom of your event business proposal, include any details concerning timing or next steps. If the event has a firm date, make sure you indicate that a signed contract must be received by a certain date in order for you to plan and execute the event. Specify the deposit that is required and the date by which it must be received. Contact Information: Be sure to include your business contact information at the bottom of the event business proposal. List your website, email address, telephone numbers, fax numbers and mailing address. Attach a business card to your proposal as well for easy reference. After sending the client your event planning business proposal, reach out to them to let them know the proposal is on its way. Tell them you will follow up in a few days to see if they have any questions. Keep the lines of communication open. Be responsive and provide personal attention. It is an indicator of how you do business and will help you close the deal in a professional manner.